are clean, refreshing, free flowing, and beautifully synchronized. The experience, ​and results, can be enchanting and eternally beneficial. Speed Networking allows the maximum connections with new people in the shortest period of time, providing opportunity for each to identify and explore possible future partnerships. As a gifted communicator, connector, and facilitator of fun, she is also the webhostess of www.WomenSpeakers.com, the largest online directory of Christian women speakers in the world, connecting thousands of event planners with speakers every year. Her network is a great place to start when planning a speed networking (SN) event for women's ministry leaders, Christian women speakers, and others in ministry. 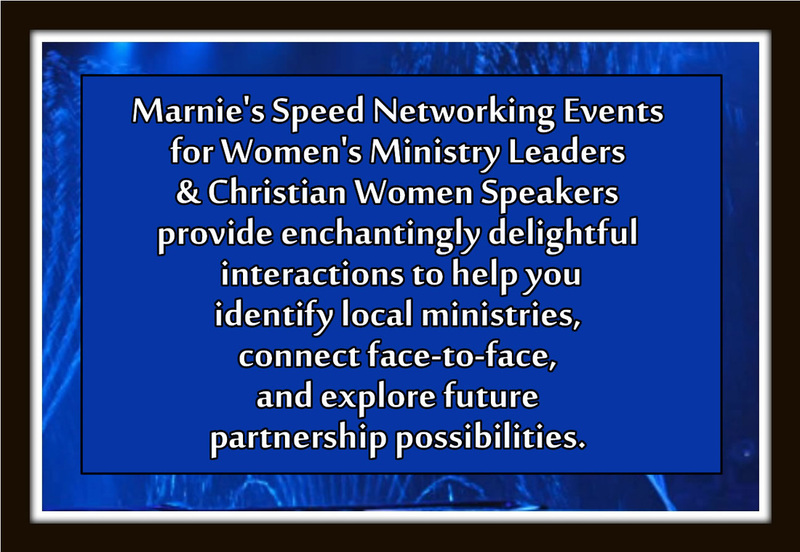 Marnie facilitates these events working closely with an event sponsor, facility hostess, local women's ministry leadership groups, online groups, plus local co-hosts. The SN event may be a stand-alone, in which case 2 hours is ideal, but many groups fit it into an existing event. The minimum time allotment is 60 minutes. If a stand-alone event, props can be as simple as name tags, bottled waters and individually packaged breath mints. Events have taken places in mega churches and small restaurants. It all depends on anticipated attendance. For groups over 50, a sound system with at least one microphone is required. To learn more about booking Marnie to facilitate your next Speed Networking event, CONTACT US HERE.